Tony Gibson walked into the Stewart-Haas Racing shop for the first time on Nov. 17, 2008, the day after the Monster Energy NASCAR Cup Series season concluded at Homestead-Miami Speedway. The confetti falling on the 2008 season also meant the beginning of a new era for Gibson — he had just finished his final season with Dale Earnhardt Inc., a team he had been with since 2002. In a few months, he would begin a new venture with newly formed Stewart-Haas Racing and driver Ryan Newman. Fast forward 10 years and Gibson, who now works as the team’s production manager, remains hard at work at the Kannapolis, North Carolina-based race shop — but the scenery looks a bit different today. “It’s been a ride, I can tell you that,” Gibson told NASCAR.com at the team shop on Jan. 25. “The first day I came in here … I walked in and there was nothing here, really, not a lot. Just some cars, bodies off, just chassis, and I remember crawling around on the ground looking at everything, what I was up against. And all my guys showed up that night because they hired the whole entire team, which was the 8 team at DEI. “We were all sitting in the lobby right there and we met with (Tony) Stewart and (SHR President) Brett Frood. And Eddie Jarvis (Stewart’s longtime business manager and friend) in the lobby right there when everybody got hired, he handed everybody their envelopes and all their stuff and insurance and stuff. 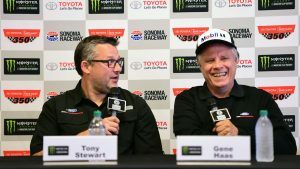 The 2018 season marks Stewart-Haas Racing’s 10th anniversary competing in NASCAR’s highest level. The organization began when Haas Automation founder Gene Haas, who was running his own team Haas CNC Racing at the time, joined forces with Monster Energy Series champion Stewart before the 2009 season. Stewart had just wrapped up a 10-year stint with Joe Gibbs Racing, which resulted in two championships and 33 wins. Stewart and Newman made up the team’s initial driver lineup and Stewart earned the team’s first championship in 2011. Two years later, SHR hired Danica Patrick to pilot the No. 10 ride, marking the first female to drive a full-time season in the Monster Energy Series. The team would expand to a four-car operation the following season, with Stewart, Patrick, Kurt Busch and Kevin Harvick behind the wheel in 2014. That same year, Harvick and the No. 4 team would earn the team’s second Monster Energy Series championship. “I think if you go back … before bringing Tony in, their goal was to finish on the lead lap,” Harvick said. “When you bring Tony Stewart in, it attracts a lot of good people and over the last 10 years, between Tony and all the good people and everything they’ve built here at Stewart-Haas Racing, they’ve been able to win two championships in 10 years and a bunch of wins. In its decade, Stewart-Haas Racing has nabbed 39 victories in addition to its two premier series titles. It formed an Xfinity Series operation in 2017, with Cole Custer piloting the No. 00 to Victory Lane at Homestead-Miami Speedway. The 2017 season also marked the team’s switch from Chevrolet to Ford. 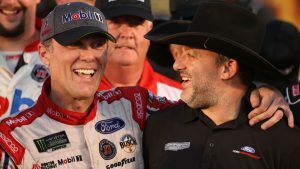 Despite the expected difficulties that come with a manufacturer switch, Stewart-Haas opened up the season with a Daytona 500 win with Busch, tallying additional wins at Sonoma and Texas with Harvick. Stewart is indeed that racer-type guy, who imparts that same culture on the gleaming white floors at Stewart-Haas Racing. But for the three-time champion, success boils down to other people – his employees. 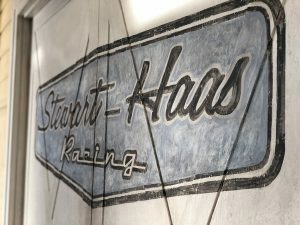 “I think it’s a testimony to the people who are the on the other side of this glass right here,” Stewart said, seated in view of the shop floor from the SHR lobby. “It doesn’t matter how many resources you have, it doesn’t matter how much money you throw at it — if you don’t have the right people to do the job it won’t happen (and) it won’t matter. The passion for racing, Stewart says, fuels his employees. It has for the last 10 years and will into the team’s future. “When you can assemble that many people that have the same common goal — I mean, there’s people that work at race shops that literally show up in time to start the day and at the time that their shift’s over at the end of the day, they’re out the door (and) it’s a mad dash to see who can get out of the parking lot first. “That’s not the way it is here. There are guys that at 9, 10 o’clock at night, they’re still here working and it’s because they’re passionate about it and they want the results. That’s what we want here and it’s just a relaxed group of guys — we’re not people to wear button-up shirts every day.